The state government of Uttar Pradesh has announced the launch of New farmers scheme termed as Kisan Sarvhit Bima Yojana. The state government aims at implementing the insurance scheme for peoples benefit through out the state. With the implementation it is certain that over 15 crore people will be benefitted. The government has implemented the new scheme with an aim to offer security and financial assistance to farmers who belong to poor and weaker section of the society. Over 3 crore families within the state will be provided with financial assistance under the scheme in the form of insurance coverage. To be eligible for getting the benefit of the scheme it is certain that you have to be the resident of the state. Farmers who are of age between 18 years and 70 years are eligible to get registered under the Bima scheme. Apart from this if your household income is below Rs 75000 yearly then you are eligible to be registered under the scheme. Insurance coverage for accident equivalent to around Rs 5 lakh coverage. Rs 2.5 lakh medical assistance to be offered to other family members for medical treatment. In case the victim requires undergoing medical treatment then he or she would be offered with free treatment facility. The victim will also be provided with care card for free for Kisan Sarvhit Bima Yajana. It is also certain that candidates belonging to Samajwadi pension scheme and BPL family will not have to provide with their family income details. In case the victim is suffering from harm done by wild animal or due to snake bite then he or she will be provided with insurance coverage. If the victim has been amputated with any of the body parts then he or she will be provided with Rs 1 lakh insurance coverage. In case any victim meets an accident outside the resident state even then he or she will be entitled to receive insurance coverage. Beneficiaries will also be eligible to get financial assistance for medical first aid equivalent to Rs 25,000. Under this scheme the state government will provide a Yojana card to the registered and eligible applicants. The card will be issued by the name of the name of the applicant and can be used to receive the benefits under this scheme. However one can also receive the benefits under this scheme without the card as well. To get the card one must fill up the card application form that is available under the scheme. Along with the application form one need to submit some of the personal documents such as age proof of the head of the family, income certificate, Khasra Kahatauni certificate, family distribution letter, death certificate, in case of accidents doctor’s certificate, medical related bills, bank account details (saving) and IFSC code of the bank. The state government has already announced that all interested applicants will have to enroll via online process. It will simplify the entire process and speed it up as well. 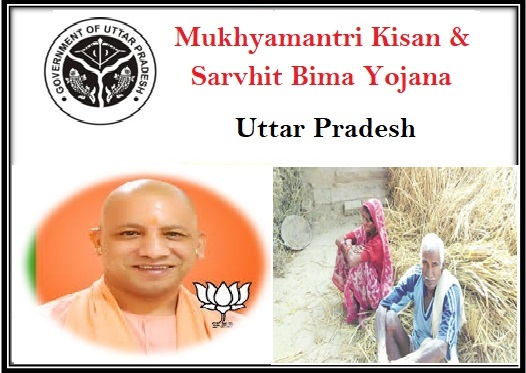 When on this page, applicants need to click on the link that says ‘Mukhyamantri Kisan & Sarvhit Bima Yojana Download.’ It is placed on the banner area, located at the top of the homepage. The applicants will have to download the form according to his/her requirement. There are five different enrollment forms. In case the head of the household has passed away due to an accident, but has not been able to get the Kisan Durghatna Bima Care Card, then applicants will have to click on the link http://www.1520up.com/attachments/claimforms/CLAIMFORM_1.pdf. It will open the first form. The second form is for those who want to opt for the card in case the head of the household is suffering from any disability that has been caused by an accident. One has to click on the link http://www.1520up.com/attachments/claimforms/CLAIMFORM-2.pdf. All those applicants who want first aid treatment in any hospital that is not included in the list will have to click on the link http://www.1520up.com/attachments/claimforms/CLAIMFORM-3.pdf. The third form will offer the benefit of Rs. 25,000 if the person needs hospitalization. Insurance agency will repay the amount after the patient is released from the hospital. Any applicant who desires treatment in a hospital that features in the list will have to click on the link http://www.1520up.com/attachments/claimforms/CLAIMFORM-4.pdf and get his/her hands on the 4th form. To get the benefits of this scheme, an applicant will have to click on the link http://www.1520up.com/attachments/claimforms/CLAIMFORM-5.pdf and download the 5th form if the head of the household has passed away after the issuance of the Kisan Durghatna Bima Care Card. The sixth form will allow applicants to get the benefits in case the head of the family has suffered from any disability that is the direct outcome of an accident. This form is only for those who already have the Kisam Bima Yojana Card.